As you may know from some of my posts, I am a frequent user of GitHub. When I started using it I didn’t realize how powerful it was. However, as time goes on, Git is looking to be more and more of a manager’s tool. When I first volunteered to help manage the processing-js project I wrote a set of guidelines that incorporated the use of Lighthouse and GitHub. The basic principle was “tell people what you are working on and the status” on Lighthouse, “do your work and let others look at it” on GitHub and finally “ask people to review” on Lighthouse. It now seems that GitHub has the ability to do all of the aforementioned items. Once you have finished a patch you can request that the owner of the repository who’s code you have forked reviews it. This is done by selecting the pull request button which opens up a discussion between you and the person who owns the repository you have a fix for. Like I mentioned this is a discussion, you and the other person can go back and forth several times before he/she is ready to pull (accept and add to their repo) your code. Git will tell you when a new note was added to the discussion or when any other actions were taken. A pull request is a fast and easy way to see all of the commits associated with the pull request without having to leave the page. Once you have committed anything to git you will get a commit url (example). This is a summary of all of the files that were changed including their specific line numbers as well as the before and after identified with a (-) and a (+) sign. This lets the person looking at your patch know exactly what you added/replaced/deleted. When a person looks at the commit with the intention of reviewing it, he/she can add comments to any line that you have edited. This is done by clicking on the line number of the file you would like to add your note to. Here is a sample commit with notes. I think you probably know where i am going with this. If a person has a patch there is no need for them to go on lighthouse and comment on a ticket. Further, there is no need for the reviewer to comment on their patch on lighthouse. All that is needed here is Git. Git gives you the ability to ask for review, get comments on a review, fix any issues, request another review, and have your code accepted all under one discussion. I know what you are thinking, how does one replace the bug tracker in order to ensure no two people are fixing the same bug. Which brings me to another one of GitHub features, git pages. GitHub allows you to add a custom page to your repository. This page can be whatever you want it to be. You can use it to list the functionality you have yet to implement or you can simply point it to a wiki where that list can be found. Here is a short guide on github pages. If you have been following my blog you would know that I have been working with Git for a while but on my Vista machine. Getting started with Git can be challenging so in order to be able to easily reproduce my steps I have created 2 separate blogs about it. #1 Setting Up GitHub on Windows #2. Adding Code To GitHub Now that I will be working on an iMax i have decided to do the same. The challenge here is to learn how to install things on the Mac (this is my first week using the not configured Mac OS) and also to figure out how to link Git to my existing repo without braking my Windows configuration. 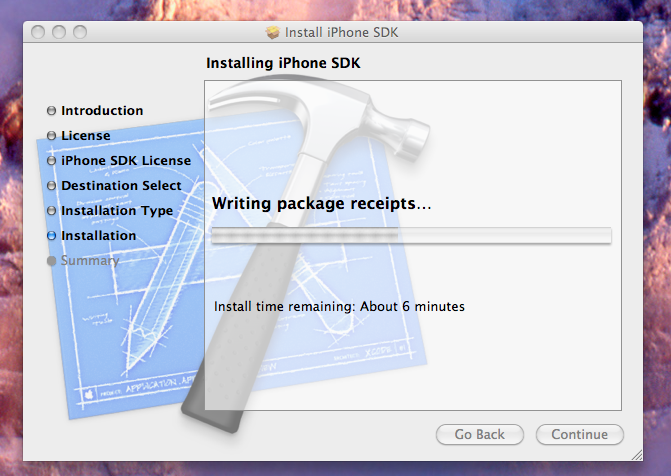 In order to run the make command you need to install xCode . xCode is a developer tool that will enable you to make iPhone and Mac OS applications. In order to download xCode you have to make an Apple Developer Account on their site. Once you are logged in go to the Downloads section and under Snow Leopard Downloads click on the xCode 3.2.2 and iPhone SDK link (note that by the time you do this the version may have changed). When the installation finished you should see a big green check mark (the first time i run the installer it failed and i didn’t even notice). Also, if you click on the magnifying glass located in the top right corner of the desktop and type in xcode you should see it listed as an application. In order to install Git download git-1.7.1.tar.bz2 (version might be different) from Git. To install MacPorts visit their download site and under the Mac OS X Package (.pkg) Installer section download the.dmg for your OS (I chose the SnowLeopard one). Once the file downloaded double click on it and an installation window will open similar to the xCode one i described above. Check out this tutorial on setting up public keys. Now if you already have Git set up on another machine use the tutorial to generate the keys/files and then edit the files manually. You are now ready to run git commands. Use clone to get a local copy of your repository. A couple of releases ago the processing.js project team decided that a bug tracker is needed to keep track of needed fixes and missing-features. We decided Lighthouse was a good and free application. Here is the link to the processing.js lighthouse project. Lighthouse has been working great but sometimes developers (including me) think it is too much work. Due to this, most of our tickets go from I started working on this….. to I am done here it is. This is fine but often the ticket is in the “I started working on this” stage for 2+ weeks. This makes it hard to distinguish between tickets that are just started or actually in the process of getting solved. A couple of days ago, while doing a ‘bulk edit’ on some tickets, I realized that you can join Lighthouse and GitHub. This is great because anytime you commit to GitHub using the command git commit -m” ” you can actually put in keywords that will be recognized by Lighthouse. So once you push your changes to GitHub, Lighthouse goes over the keywords and updated the ticket. The only downfall with this is that you cannot add a message to the ticket, instead Lighthouse adds your commit message. So you have to make sure the commit message is clear and contains enough information. 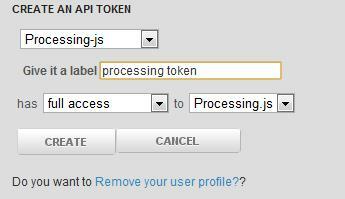 Simply select ‘processing-js’ from the drop-down menu. Lighthouse will then provide more options: label, access, and project. Fill in anything you want for the label. The access must be full access. Finally select the project and press create. Lighthouse will generate a Token and display it on the screen. In a newly created ‘Your API Tokens’ section. Copy the token, you will need to put it into GitHub. This will display all of the services that GitHub provides. Select Lighthouse from the list of Hooks, and fill out the form that appears on the right. Notice, GitHub provides instructions on how to do this below the form. However, for our processing project the subdomain is processing-js, the project id is 41284, the token is the token you copied from LightHouse. Ensure you set the ‘Active’ checkmark, and press Update Settings. Previously, I posted a tutorial on setting up GitHub and Git Bash. Now I would like to show you how to get new code into ur repository. Those are the steps, now before we get started bookmark this Git cheat sheet its a good reference. A local branch is a version of your code package saved on your home machine. I believe you can have as many branches as you want. A remote branch is one that sits on the GitHub social coding site, users can select this branch and download code that belongs to this branch alone. Before you can submit the changes to GitHub, you have to commit them on your local machine. This command will commit all of your changes and allow you to write a message in vim. Vim guide. The message should be significant, as everyone will read it to see whats new from the previous versions. Now you are ready to update the remote branch. Writing objects: 100% (5/5), 617 bytes, done. After you do all of this, log in to ur GitHub account and go to your repository. If you roll over ‘all branches’ you will see your new branch. Select it and try downloading the contents to ensure that nothing is missing. Note, I have reported a bug, somehow the download functionality in GitHub doesn’t always work. Hope this tutorial helps 🙂 Feel free to post comments. I spent the last week working on uploading a new branch to GitHub using Git Bash (tutorial coming soon). If you are still trying to set up GitHub and Git Bash check out my tutorial HERE. All this for a simple upload? The basic steps are: create a branch both remote & local, put your new files/folders into the repository directory on ur local machine, make sure Git Bash prompt is working with this branch, commit ur work including a message, push the repository back to GitHub. It seems like a simple process, and it might still prove to be. I must have done the steps a million times, but every time I logged on to my account on GitHub, pointed the browser to the correct branch, and downloaded the ZIP file I found none of my changes. I couldn’t figure out what was going on. Finally, I spoke to Alistair MacDonald (F1LT3R) on IRC (Mibbit ), and he helped me thorough the steps of making a branch and uploading it. Still, the download didn’t contain any of my updates. I have a Vista machine and i needed to set up Git and GitHub in order to finish my processing.js project. What is Git and GitHub? Basically it is an online code sharing community that uses repositories to maintain code versions. What will u need to do? So there should only be one code repository per project. If a repository DOESN’T exist u can create one. However, if it DOES exist then you have to fork it. FORK: By forking a project instead of cloning, creating a new GitHub repo, and pushing to it, you allow us to create a link between your fork and the original. This link helps us keep you informed of changes to the original codebase and make it trivial for you to notify the originator of changes that you have made and would like have reviewed. If u are not logged in (to GitHub), log in. This will bring u to the home page, if not click on the GitHub Social Coding logo on the upper left corner of the page. For windows, you can use cygwin or msysgit. I am using msysgit. The command window should open up. Type ssh-keygen -C “youremailinquotes@com” -t rsa to create a key. Here is another tutorial on SSH Keygen. Note: You do not need to put in any input after the ssh-keygen command, just press enter after every prompt. Tell GitHub apps about u. Log into GitHub, select “Account” (top right corner), select “Global Git Config”. Copy and paste the commands in the pop-up into the Git Bash command prompt. Add SSH key you just created into GitHub. Open SSH key in a text editor. Looking back at the ssh-keygen command, you identified “C:\Users\YourNameHere\.ssh\” as the path. Open this folder (it might be hidden). Open id_rsa.pub in a text editor and copy its entire contents. Test to make sure that everything works. On the Git Bash command prompt type the following command: ssh git@github.com I got a connection confirmation prompt and I had to type yes.